The weather in June was in comparison with the last year more favourable as for the temperature and precipitation. Nevertheless the precipitaion was very uneven, the diferences between localities were up to 20 mm. Such precipitation decreased moisture deficit of May. 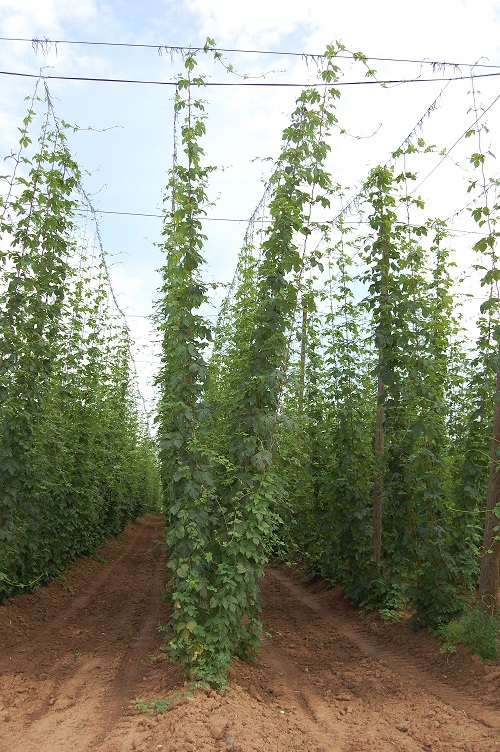 Therefore the intensity of hop growth was revived and overhelming majority of hop plants reached the top of the trellis. The average month temperature was more than by one degree higher than long-term average. By the end of June two thirds of areas are in the phase of finishing the growth and one third started to blossom already. Despite of frequent weather changes the health state of hops is satisfying. The third or fourth chemical treatment against Peronospora is being applied now depending on locality. In more humid places due to the rich rainfalls the appearance of Peronospora was more dangerous but thanks to three tropical days and prevailing temperatures above 24°C Peronospora is being reduced. The occurrence of Hop aphid was very different as for localities but at all the areas at least one treatment was applied. Equally the occurrence of Red spider mite was very uneven from sporadic to very strong. Chemical protection against Red spider mite was applied at about one half of areas and remaining places will be treated during the first decade of July.